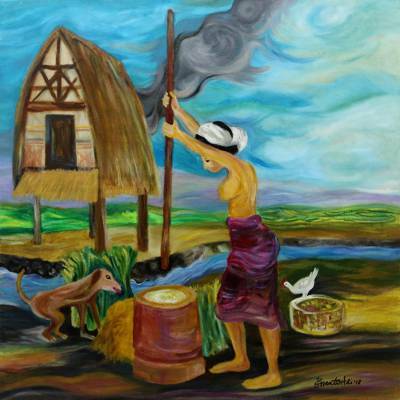 Signed Quotidian Impressionist Painting from Bali (2018), "Waiting"
Working in an impressionist style, Bunanto paints a scene of quotidian life in a Balinese village. Taking center stage, a woman uses a stick to pound herbs and spices in a large mortar for the day's meal. A dog looks on with a begging face, and the duo is framed against a raised hut in the background.